First appearance "Mario of the Deep"
Neptune, Lord of the Deep, better known as King Neptune is a merman, and the ruler of the Aqua Land. He is the king of the Mermushrooms, despite not actually being a Mermushroom himself. King Neptune generally has a very good disposition, displaying a very calm and pleasant attitude unless he is pushed too far. Despite his peaceful nature, he is not afraid to fight against anyone who stands in his way. King Neptune's reign over Aqua Land is brought to a halt when Barra-Koopa and his Bloober minions invade Aqua Land and enslave its entire Mermushroom population. King Neptune tries to reason with Barra-Koopa without threatening him, but Barra-Koopa disregardes his advice, and orders for him to be locked up in his own dungeon. Locked away from the rest of society, King Neptune can do little about his situation until help arrives. Led by a female Mermushroom, Mario, Luigi, Princess Toadstool and Toad break into the dungeon and rescue King Neptune. 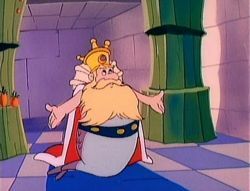 Now free, King Neptune agrees to help them rid Aqua Land of Barra-Koopa. King Neptune leads the charge by riding atop a Whale, which he uses to smash a hole in wall leading into his own throne room. Mario's group then enters the throne room on four of King Neptune's seahorses, and uses his swordfish to fight against Barra-Koopa and his Bloober trio. Eventually, the Koopa Pack is defeated, and King Neptune thanks Mario's group for their help in saving Aqua Land. This page was last edited on September 6, 2018, at 18:11.